Today I was going through a step of being a new home owner. Calling around companies to find the lowest price on oil. I technically started this process a month ago and have been posting updated on that PEIinfo thread as time went on. There was a few stragglers who I had a hard time connecting with, or getting a call back. Last Friday, I called Kenmac Energy, talked to one of the sales guys and wrote down their discounted price/offer and moved onto the next one. Lone be hold, earlier this week, on Tuesday, I got a follow up call from Blaine Morrision. Blaine had previously (years ago) sold me a Jeep Grand Cherokee when he worked at Experience Hyundai and I always seen him out and about. He was always polite enough to say hello! So I was amazed when he called me up late Tuesday asking if I had any further questions. He remembered me from buying the Jeep from him and I told him what I was up too, calling around price shopping for the best deal. Our conversation ended with him having to look into something for me and told me he'd get back to me. Today, I called Island Petroleum to get some prices and again, the sales guy wasn't available and I was asked to leave a message. Instead I asked to talk to someone else who is more available or not so busy and left my info. 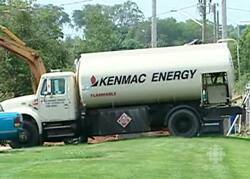 Then Blaine, from Kenmac Energy, called me back and went over some things and let me know his best offer. I took it, wrote it down and moved on. Then a few minutes later, the Charlottetown manager of Island Petroleum called me back while at the same time I was going back to the PEIinfo thread and someone (Foxrun) suggested creating our own discount group. What an amazing idea I thought and mentioned it to the manager of Island Petroleum. He didn't seem too anxious to tell me much and kept his cards close to his chest. I didn't get the warm fuzzy's after I explained to him what I was wanting to do. So, I called Blaine back to discuss a group discount who was more then polite and willing to talk to me about how things worked. I got the warm fuzzy's from him and after our phone call I went to work on a group discount plan with Kenmac. At 1pm, I quickly made up a simple page on the discount and started collecting information/names. By 4pm, Blaine had called me back asking me to take down the discount I had posted per litre. Obviously, it was a good idea for Kenmac as they don't want other groups getting mad at Kenmac Energy regarding our discount. Blaine reported he was already getting a few calls on this. Shortly later he called me back to request something else and he was amazed that this had gone viral so quick. Who knew creating a simple page on oil discounts would attract so much attention. As of now, we have around enough Islanders interested that combines for a total of 70,000 litres of oil per year. By tomorrow, I am hoping that number will have almost doubled and we'll be able to bring the oil company 120,000 litres of oil. This equals out to be about $70,000 (billed individually). Assuming everything else goes good, it's all going to Kenmac Energy all because of a politer sales person then the manager of the competition. And of course, thanks to social media.